Sofitel Bora Bora Private Island epitomizes the French art of elegant hospitality in a unique experience on a private retreat. The hotel is nestled on its own private island, surrounded by a beautiful turquoise lagoon, and just minutes by private shuttle from Bora Bora. This unique boutique hotel combines luxury French style with local Polynesian decor. To feel even more at home, the hotel is pleased to offer complimentary WIFI and daily refilled mini bar. Sofitel Bora Bora Private Island is located on Motu Piti U'uta, a short private boat ride from the main island of Bora Bora. 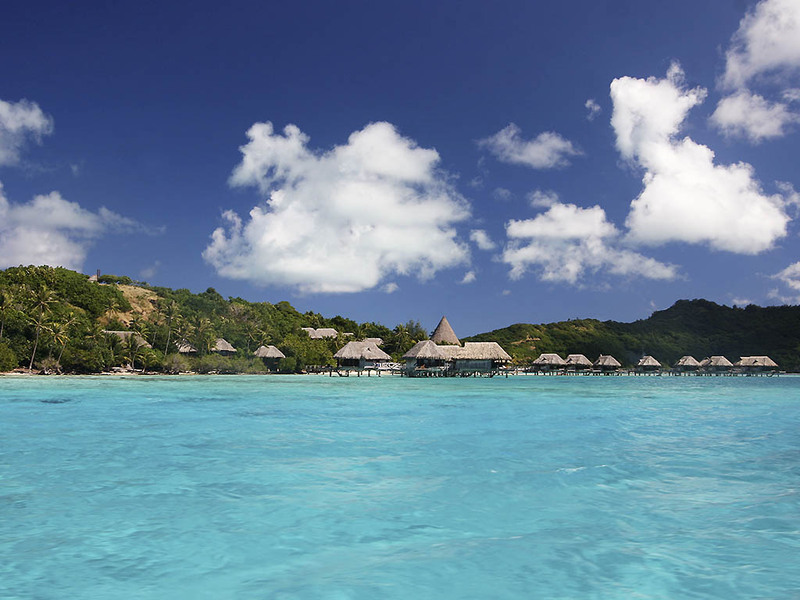 Conjure up images of an idyllic life on a private island, and you will be close to the magic that is Bora Bora. No doubt the first thing on your mind when you stay at Sofitel Bora Bora Private Island is relaxation, but when you are ready to explore you won't be disappointed. There is plenty to do, including some of the best snorkelling in French Polynesia. Discover true paradise in stunning blue waters, pure white sand beaches and the preserved nature of our very own private island boasting a unique botanical garden,360 degree panoramic views, luxurious sunsets, and an incredible coral garden. Romantic Evening with Sunset Champagne followed by a gourmet dinner show on the beach. A Lagoon Tour swimming with rays, sharks and ending with a Polynesian picnic. ISLAND LUXURY LODGE, 1 King Size Bed 34 m², 12 m² terrace, King Size bed, air conditioning, fan, safe, minibar, rain shower, bathroom and separate WC, no rollaway bed but existing sofa bed. Manu Tuki, housed in an impressive chapel pandanus restaurant, offers breathtaking panoramic views of the lagoon and Mount Otemanu Bora Bora. Fine cuisine and wine cellar complete this enchanting setting. Located on a panoramic terrace (360° lagoon view), the Mako bar provide the perfect place to relax at any time of the day. Local and international cocktails, we also offer a variety of cigars. Views were amazing, staff were extremely friendly. Benji made the entire check-in experience a breeze. It really kicked off our stay at the Sofitel Bora Bora island to a great start. The rooms were spacious and nice, but because they're not entirely enclosed we did have a lot of critters in our room. When packing we found a few beetles in our luggage. Not a big deal, since we are on a remote island, but would have been nice if the windows were entirely enclosed like in Sofitel Moorea. Food was okay, nothing overwhelming. I would and have recommended this hotel to others to stay at for their honeymoon as it was a great experience. Simply put - I can't imagine a better location and the staff was fantastic. The bungalows are bit dated as some have commented, but that doesn't mean the experience is lessened at all. If anything, the dark wood bungalows really make you feel like you're in the islands and who needs another sterile white room with gray furniture? Also, the limited number of bungalows (and being on a private island) makes this a truly spectacular hotel. The only downsides... dinners were average, especially for the cost and sometimes the portions were very small, so the only other option is to take a free boat ride to the main island. And most importantly - the coral gardens. This is where Sofitel will send you to snorkel (along with many other hotels). Will you see a ton of fish - yes. Probably because many tours come to this location and they feed the fish. Will you see an intact coral garden - no. Sadly, we even witnessed people standing on the coral -- Unacceptable. Not the fault of the hotel, but there really needs to be some education and steps (that all the hotels take) to inform guests what we are all doing to the reef. Like most of the planet, Bora Bora is feeling the effects of global warming and given the over development of the reef, if all hotels don't start addressing that fact soon, this glorious location will be ruined. Everything was great, however the food could use improvement. we stayed with you for a few days in an overwater bungalow and it was just fabulous. A dream came true. A paradise for us no noise, excellent staff from housekeeper to waiter etc... A special thanks to Tita who works at the restaurant as a waitress, Tama at the bar and also the young girl the concierge who was so helpful and very kind. Overall stay was very good. We first had a room with no shower, needed one. We were moved to another room on the second day and that was fixed. We would have liked more information as to what was going on in the hotel and on Bora Bora like other restaurants, shows, shopping etc. Everyone was very accommodating and nice. We had a good experience but the prices were very high for rooms and for food. It was a wonderful personalized experience. Staffs are good, Food is good. But, facilities are so poor. Need to improve air conditioner. It was always high humidity. Need to repair some of roof. Somethings(lookd like part of roof) has fallen down from roof when got strong wind or heavy rains. I absolutely loved the welcome horn, guitar and coconut drinks. The hotel grounds are well kept and beautiful. The hut was wonderful except it was hot! The air unit could not keep up being there are holes in the ceiling allowing warm temperatures in. The ceiling fan was broke when we arrived. A new one was in the next day. I was impressed by the promptness. We were not impressed by the breakfast buffet or the buffet for dinner during the Polynesia dance show. We really enjoyed the show. Staff was amazing, very helpful, and courteous. Bungalow was well furnished with spacious patio. Food was good but not a lot of varieties. Would love a stand up shower in our bungalow. Amazing views. Great for snorkeling. Convenient transportation to main island and airport. Lovely accommodations and wonderful, caring staff. Great local scenery and snorkeling.